Two cases have been confirmed at NUI Galway in the first cases in the country so far this year. ALL THIRD LEVEL students in Ireland have been told to check that they have been vaccinated against measles after an outbreak of the disease in NUI Galway. Two cases have already been confirmed at the university. The Health Protection Surveillance Centre, which monitors diseases in Ireland, said that because of the interaction between students from different colleges, all students in the country should make sure that they have been immunised. 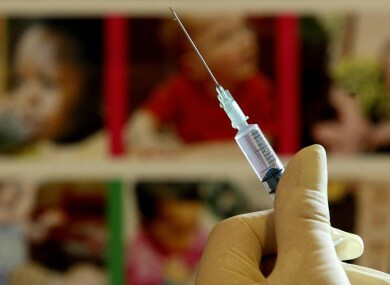 Most Irish students would have received two doses of the MMR vaccine as part of the national immunisation programme. Measles is passed on through direct contact with an infected person or through the air when an infected person coughs or sneezes. Symptoms include fever, a rash, a cough, and conjunctivitis, but complications often occur , such as lung infections. Measles is highly contagious and the HPSC has warned that vaccination is the only way to prevent outbreaks occurring. There have been 420 cases of measles in Ireland since 2008. This is the first notification of the disease so far this year. Email “Students told to check that they're vaccinated after measles outbreak”. Feedback on “Students told to check that they're vaccinated after measles outbreak”.